The regular meeting of the Harford Township Supervisors was called to order in the township office by Vice-Chairman Conrad Owens at 7:00 PM. Supervisor Furney was present along with Secretary/Treasurer Carolyn Jennings, Roadmaster Jim Phelps, and Township Solicitor Jamie Hailstone. Supervisor Phelps was absent. Visitors present were Ted Brewster and Nick Estabrook. The minutes of November 15th were reviewed and accepted on a motion by Furney, second by Owens. Motion carried by two yes votes. The bill list was approved as printed on a motion by Furney, second by Owens. Motion carried by two yes votes. The treasurer’s report was filed for audit. The status of the roller was discussed again. Supervisor Owens would prefer to purchase the machine that is currently being rented. Supervisor Furney would prefer to send this machine back and then rent one again next year for the roadwork season. The employees had requested to change the paid holiday for Christmas to Friday, December 23 instead of Monday, December 26. The supervisors agreed to approve this request. Two new employees were recently hired: Steve Welch of New Milford for part-time and Robert Weida of Harford for full-time. The saw shop and the compressor station were both intending to use holding tanks. However, DEP is not able to approve the sewage planning for this as the township’s ordinance does not allow it. The supervisors will consult with the township’s sewage enforcement officer from JHA and the township solicitor to look into updating the holding tank ordinance. The supervisors reviewed a subdivision for Spencer and Charlotte Empet and had no objections. They also approved driveway and underground utility crossing applications for Williams Field Services on Old Route 11, Harmony Road, and Jeffers Road. The annual reorganization meeting will be held Tuesday, January 3, 2017 with the regular meeting to follow. The township solicitor is reviewing documents from Cabot regarding the disposal of contaminated soil from Pennay Hill Road. Supervisor Owens announced that he is officially resigning effective immediately due to being excluded from three meetings and the situation with the roller. As there was no further business on the agenda and no action could be taken without a quorum, the meeting ended at 7:37 PM. The regular meeting of the Harford Township Supervisors was called to order in the township office by Chairman Doug Phelps at 7:00 PM. Supervisors Owens and Furney were present along with Secretary/Treasurer Carolyn Jennings, Roadmaster Jim Phelps, and Township Solicitor Jamie Hailstone. Visitors present were Ted Brewster, Maureen Warren, Dorothy Hagenbuch, Dale Ferger, Jacob Rosen, Brian and Val Sanauskas, Terry VanGorden, and Garry Foltz. The minutes of September 20th were reviewed and accepted on a motion by Phelps, second by Furney. Motion carried by two yes votes, Owens abstained as he was not present at that meeting. The minutes of October 18th were reviewed and accepted on a motion by Furney, second by Owens. Motion carried by two yes votes, Phelps abstained as he was not present at that meeting. The bill list was approved as printed on a motion by Phelps, second by Furney. Motion carried by three yes votes. The treasurer’s report was filed for audit. Dale Ferger asked for the amounts of the legal issues covered by Kreder Brooks Hailstone and Jacob Rosen asked for an explanation of what work was done for the amount paid to David Klepadlo. Work on the Dirt & Gravel Roads grant for Lower Podunk Road is ongoing. Roadmaster Jim Phelps gave information on a buyout of the roller that is currently being rented and also a comparison of the price of a new machine. The supervisors were not ready to make a decision and will decide later on a plan for next year. Roadmaster Phelps also suggested the possibility of renting a boom mower for a month to be able to continue mowing during the colder weather. It may be a good idea to look around for options to buy something new as the machine we have now is old and needs some repairs that would not be worth making. Different types of machines will be considered and a decision will be made at a later date. Jackson Township has a used 9 ft. spreader in good condition that they would be willing to sell for $1800. This would be good to replace the one on the Kodiak as the back corner has rotted through on the bottom. 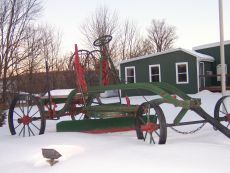 A motion was made by Phelps, second by Owens to purchase this spreader from Jackson Township. Motion carried by three yes votes. The Clean Air Resolution was discussed as an effort to encourage New Milford Township and Susquehanna County to adopt a Clean Air Ordinance. Several comments were heard from the audience about concerns regarding the proposed incinerator. Supervisors Phelps and Furney felt that a resolution should be more of an in-house policy and should not tell another township how to run its business. The planning commission form for the saw shop on Fair Hill Road will continue to wait for DEP to approve the sewage planning. and to set the 2017 real estate tax rates: general purposes 4.63 mills and fire protection 1 mill. A motion was made by Furney, second by Phelps to accept Resolution #6-16 as presented. Motion carried by three yes votes. The secretary reported that a request was made by Dan Farnham of Farnham Associates for the township to place rock for improved access to the water plant. The supervisors tabled the matter for further discussion. The transition is underway and it will take some time for the new operator to become familiar with the conditions at the plant and to begin doing the testing. More details still need to be worked out on how repairs will be made when needed. A letter was received from Susquehanna County 911 that they will be holding two sessions on active shooters with information on how to respond in these situations. Garry Foltz requested clarification on the work that was done recently on Foltz Road. The only cost involved was for brushing by a two man crew for a day and a half of work. He also asked if something could be done about the excessive spread of dust coming from rock crushing operations at the Lopke Quarry. Supervisor Owens agreed to discuss the problem with his contact at DEP. Brian Sanuaskas mentioned a problem with the pipe at Jessica Louderback’s driveway where water is coming across the road which could cause problems when it freezes. Supervisor Owens and Roadmaster Phelps will go out and check the situation. An executive session will be held with the township solicitor after the meeting to discuss personnel issues and some possible code violations. A motion was made by Phelps, second by Furney to adjourn the meeting at 8:04 PM. The regular meeting of the Harford Township Supervisors was called to order in the township office by Vice-Chairman Conrad Owens at 7:00 PM. Supervisor Furney was present along with Secretary/Treasurer Carolyn Jennings, Roadmaster Jim Phelps, and Township Solicitor Jamie Hailstone. Supervisor Phelps was absent. Visitors present were Ted Brewster, Maureen Warren, Mike Barhite, Dale Ferger, Jacob Rosen, Glenn Eby, and Joe Hunt. Supervisor Furney asked to suspend approval of the minutes of September 20th as Supervisor Owens had been absent at that meeting. The bill list was approved as printed on a motion by Furney, second by Owens. Motion carried by two yes votes. The treasurer’s report was filed for audit. Dale Ferger questioned the amount paid Kreder Brooks Hailstone and what legal issues were covered as well as attendance at meetings. The Dirt & Gravel Roads grant contract for Lower Podunk Road in the amount of $118,097 was approved and signed. Bids were opened for this project for approx. 7000 tons of DSA – New Enterprise Stone $10.10/ton FOB and a paver w/operator & laborer for 3-5 days – Barhite Excavating $1800/day and RPD Enterprises $3500/day. This project was anticipated to be done this year, but a note from New Enterprise Stone stated that the material may not be available until Spring 2017. A motion was made by Owens, second by Furney to accept the bid from Barhite Excavating for the paver and from New Enterprise Stone for the material if available. Motion carried by two yes votes. A complaint was made on a low, narrow section of Orphan School Road. Roadmaster Jim Phelps recommended that fill be brought in and placed by a contractor in a 300 ft. x 20 ft. area. Fill could be obtained at a nearby quarry for $20/load with about 40 loads needed. Prices to do the job were given by three contractors: Barhite Excavating $6,750, Frank Payne Excavating $6,000, and Estabrook Excavating $5,800. A motion was made by Owens, second by Furney to spend $800 on fill and $5,800 for Estabrook to do the job. Motion carried by two yes votes. Information was given that the house on Foltz Road will be rented by the end of the month by a truck driver who would like to be able to get his truck in and out. The Roadmaster has looked the road over to find out what needs to be done. Brush cutting and pipe work could be done in-house, but he would like to bring in a bulldozer for one day at a cost of $1000 to smooth and shape the road. Supervisor Furney would like to hold off and get the regular road maintenance finished up first. The Roadmaster has gotten prices for flake calcium as the township’s supply is running low. There is probably enough left to last through the winter and then look at getting some in the spring. There was some discussion about continuing to rent a roller, but no decision was made. Roadmaster Phelps brought up the idea of bringing up a contractor with a side dozer to use for a week on different areas to work under the guardrails and improve drainage concerns. This way people could see the results and if it would be worth it to have one made for the township. The cost for this would be $95/hour for 40 hours at a total of $3800. No action was taken. The Roadmaster has called some of the applicants for employment to be able to meet with them about a full-time position. The division order for the Decker pad was signed, along with a change of address form to fix the township’s address. The Clean Air Resolution received last month was brought up again but nothing further has been done. The supervisors reviewed a land development plan that was submitted to the county planning commission by DTE Energy for a compressor station on Tingley Lake Road. They had no objections. A land development plan was also received from the county planning commission for a saw shop at Juan Loja’s existing stone quarry on Fair Hill Road. Along with that, a sewage resolution for that development was submitted by Joe Hunt of JHA Companies which would need to be adopted by the township and then go to DEP for approval. A motion was made by Furney, second by Owens to adopt this Resolution #5-16. Motion carried by two yes votes. The form for the county will be addressed again once DEP has given approval of the sewage planning. The contract for 2017 has been received from the Harford Vol. Fire Company to provide services in exchange for 1 mill property tax. A motion was made by Furney, second by Owens to accept this contract. Motion carried by two yes votes. The budget for 2017 has been proposed and is ready to be advertised for public inspection. A motion was made by Furney, second by Owens to advertise the 2017 Budget as presented. Motion carried by two yes votes. The grant application to purchase and install new grinder pumps was submitted to DCED. Township Solicitor Jamie Hailstone spoke about the need to appoint a new plant operator/engineer. Since the indictment of Dave Klepadlo, contact with DEP and USDA has made it clear that a change is necessary. The supervisors have met with Joe Hunt, owner of JHA Companies, who currently handles the township’s building and sewage permits and also several engineering projects. Mr. Hunt is a DEP certified operator and has had many years of experience with different sizes and types of wastewater treatment facilities. A motion was made by Owens, second by Furney to appoint JHA Companies for township sewer plant operations. Motion carried by two yes votes. A motion was made by Owens, second by Furney to appoint JHA Companies for township sewer project engineering. Motion carried by two yes votes. A meeting will be set up to prepare for and set a timeline for this transition. Jacob Rosen asked how much the Roadmaster is allowed to spend without supervisor approval and if the work for the sewer upgrade project that Dave Klepadlo was paid for had been approved. Mr. Rosen also spoke about the Clean Air Resolution and urged for support of their effort to stop the proposed incinerator. Maureen Warren asked about the legal issue at Tyler Lake. Jamie Hailstone replied that the lawsuit was settled before trial with the township now being able to continue the work there and no money being paid out. A motion was made by Owens, second by Furney to adjourn the meeting at 8:09 PM and then go into executive session. The regular meeting of the Harford Township Supervisors was called to order in the township office by Chairman Doug Phelps at 7:02 PM. Supervisor Furney was present along with Secretary/Treasurer Carolyn Jennings, Roadmaster Jim Phelps, and Township Solicitor Jamie Hailstone. Supervisor Owens was absent. Visitors present were Ted Brewster, Maureen Warren, Dorothy Hagenbuch, Robert Supancik, Gerry Yushinsky, David B., Rich Tomlinson, George Bleck, Garry Foltz, Adam Briggs, Jacob Rosen, Joanne Smith, and Trevor Payne. The minutes of August 17th were reviewed and accepted on a motion by Phelps, second by Furney. Motion carried by two yes votes. The bill list was approved as printed on a motion by Furney, second by Phelps. Motion carried by two yes votes. The treasurer’s report was filed for audit. The resignation and rescind letters from Supervisor Owens last month were briefly discussed. Township Solicitor Jamie Hailstone advised for the rescind letter to stand with no vote necessary. Jacob Rosen questioned the amounts paid to David Klepadlo and the news of his recent legal problems. Township Solicitor Jamie Hailstone has been in contact with USDA about his work on the sewer upgrade project. Everything done to this point is okay, but some changes may need to be made going forward. The Dirt & Gravel Roads grant application for Lower Podunk was approved and the contract is in the mail. Roadmaster Jim Phelps has met with Ed Sumski to prepare the bidding specifications. The section being worked on is from SR 547 to the bridge and will involve U-drain, small fill areas, and DSA placement. The township in-kind will be pipes and labor to install them. Three quotes were given for use of a mini-excavator: Estabrook $90/hr, Barhite $105/hr, and Dale Payne $120/hr. A motion was made by Phelps, second by Furney to continue the grant process for Lower Podunk Road by signing the contract, advertising for bids, and using Estabrook’s excavator. Motion carried by two yes votes. During ditchwork and pipe flushing on Plank Road, it was discovered that in three pipe outlet areas on the hill the ground has eroded back under the cables. These areas need to be stabilized with some larger rock and the pipes reset to the proper position. Three contractors were asked for a price to do this project: Estabrook quoted $4800, Barhite quoted $5500, and Frank Payne declined. After some discussion, a motion was made by Phelps, second by Furney to accept Estabrook’s price to do the job. Motion carried by two yes votes. The 95 Mack needs a new hood as the one it has now is not functioning. Estimates were gotten at $2500 for the hood from Cook Brothers and $2000 for painting from Molenko’s. A motion was made by Phelps, second by Furney to be able to find a hood and get it painted, weather permitting. Motion carried by two yes votes. The purchase of the roller is still being discussed and another possibility to consider is the replacement of the boom mower. Both ideas will be worked on further during budget preparations. The permit for the dry hydrant in Kingsley was received from the Conservation District. The fire companies can now proceed with getting it installed. Employment applications still need to be reviewed. The supervisors approved an assessment permit for Robert and Deborah Schultz for a storage building on Wescott Road. A division order was received from Cabot for the Decker well pad, but the township’s address is incorrect. A motion was made by Furney, second by Phelps to be able to sign it after the change is made. Motion carried by two yes votes. A resident of Cobb Road has offered to donate some land to the township to be used as a turnaround. The supervisors felt it best to take time to consider the idea as there would be a lot involved in that process. A letter was received from the Susquehanna Clean Air Network, which is a group organized in response to the proposed incinerator. They included a resolution which they asked the township to support for the passage of a clean air ordinance. The supervisors would like to table the matter for now and have the township solicitor review it. Ted Brewster asked about the upcoming trial for the Tyler Lake lawsuit and about permits needed for a cottage going up at Tingley Lake. Rob Supancik spoke about the ballfield and their successful season this year. He asked the supervisors if they would be willing for Rocky Estabrook to dredge out the ditch in the back to make the field drier for a cost of around $3000. If this works well, there may be a possibility of using that area as a soccer field. A motion was made by Phelps, second by Furney for Rocky Estabrook to do the work with a cap of $3500 and for the township’s small truck to be used for the project. Motion carried by two yes votes. Maureen Warren asked if anything more has been done with Nine Partners Road. Joanne Smith asked about an area of Stephens Road that needs to be mowed. Manpower has been an issue with getting mowing done this year. Garry Foltz mentioned problems where the oil was sprayed on Stephens Road and with the paved area that ProSeal put down. He also asked what the road crew has been doing and who has been running the equipment. George Bleck made a complaint about the condition of Tyler Lake Road and asked if something could be done there. Rich Tomlinson made a comment about the roller situation and that it may be better to just rent one for the summer roadwork season. Budget workshops will be held October 10 & 17 at 3:00 PM. An executive session will be held after tonight’s meeting to discuss legal issues. A motion was made by Phelps, second by Furney to adjourn the meeting at 8:14 PM. The regular meeting of the Harford Township Supervisors was called to order in the township office by Chairman Doug Phelps at 7:00 PM. Supervisor Furney was present along with Secretary/Treasurer Carolyn Jennings and Township Solicitor Jamie Hailstone. Supervisor Owens was absent. Visitors present were Ted Brewster, Maureen Warren, Morgan Turner, Mike Barhite, Glenn Smith, Margaret Smith, Joseph Cowan, Matthew Cowan, Jacob Rosen, Dale Ferger, Joanne Smith, Brian Sanauskas, Valerie Sanauskas, Jessica Louderback, Rich Tomlinson, Wendy Phillips, and several others who did not sign in. A resignation letter was received on August 3, 2016 from Supervisor Owens and a letter to rescind the resignation was received on August 8, 2016. Township Solicitor Jamie Hailstone spoke about the matter and his advice was that the resignation letter be accepted and that the rescind letter not be accepted. There were many comments from the audience regarding the situation with most people in favor of not accepting the resignation. A motion was made by Phelps, second by Furney to table the resignation for one month and have the township attorney consult with the judge and report back next month or in executive session. Motion carried by two yes votes. The minutes of July 19th were reviewed and accepted on a motion by Furney, second by Phelps. Motion carried by two yes votes. The bill list was approved as printed on a motion by Furney, second by Phelps. Motion carried by two yes votes. The treasurer’s report was filed for audit. Dale Ferger had several questions on the bills from Barhite Excavating and what work was included in the amounts paid. Jacob Rosen questioned the bidding process and why it was put out per hour and not per job. Margaret Smith asked if contractors in the township should have priority over those outside the township. Only one bid was received for spraying oil for dust control. Suit-Kote submitted a price of $1.08 per gallon. A motion was made by Furney, second by Phelps to accept this bid. Motion carried by two yes votes. Two bids were received for the ditching project. Stafursky Paving submitted a price of $2.89/ft. and Barhite Excavating submitted a price of $2.75/ft. A motion was made by Phelps, second by Furney to accept the lower bid from Barhite Excavating. Motion carried by two yes votes. Two bids were received for the fill project. Measurements came up with a total of 1,140 ft. on two sections of Orphan School Road and one section of Upper Podunk Road. Stafursky Paving submitted a price of $59,775 and Barhite Excavating submitted a price of $24,950. After some discussion over the large difference in price, a motion was made by Phelps, second by Furney to accept the lower bid from Barhite Excavating. Motion carried by two yes votes. Roadmaster Jim Phelps had gotten quotes from three vendors for flushing pipes thoughout the township. All-American Rooter was at $150/hr. for a one man crew, Barna Trucking was at $150/hr. for a two man crew, and Roto-Rooter was at $650/hr. for the first two hours and $250/hr. for each additional hour with a one man crew. All-American Rooter and Barna Trucking had both been tried with Barna Trucking having better equipment and more productivity. A motion was made by Furney, second by Phelps to accept Barna Trucking at $150/hr. for pipe flushing up to a total cost of $15,000 for the year. Motion carried by two yes votes. The Roadmaster had also gotten quotes on replacing the asphalt approach at the intersection of Stephens Road and SR 547. Harris Paving declined as they do not work in the roadway, Barhite Excavating declined as they are not currently doing asphalt work, Bothar Construction in Binghamton had given a price last year of $17,680, and Pro Seal in Hallstead had given prices at the beginning of this month of $15,100 for 24 ft. wide x 75 ft. long and $13,775 for 24 ft. wide x 50 ft. long. A motion was made by Furney, second by Phelps to accept the quote from Pro Seal in the amount of $15,100 for the 24 x 75 approach. Motion carried by two yes votes. There is a drainage concern on White Road and Three Lakes Road in the access area for the gas pad. The township will try to work with the gas companies to come up with a plan and share the costs involved. The Roadmaster recommended having two new pipes put in. He requested having Dale Payne excavate the one on Wescott Road and having Rocky Estabrook excavate the one on Devil’s Elbow Road. The township will supply the pipe and labor for the jobs. A motion was made by Phelps, second by Furney to accept the Roadmaster’s recommendations with the cost of both jobs not to exceed $3000. Motion carried by two yes votes. The next round of Dirt & Gravel Roads grants is open and applications need to be put in by September 2nd. The Roadmaster would like to prepare one for Lower Podunk Road, which would involve pipes, ditching, fill, and DSA. A motion was made by Phelps, second by Furney to accept the Roadmaster’s recommendation on this grant application. Motion carried by two yes votes. The township is now renting a roller from Cleveland Brothers due to safety issues with the old one. There is an option to purchase the machine, but that will be discussed at a later date. The process of putting a dry hydrant in Kingsley is continuing. A motion was made by Phelps, second by Furney for the Conservation District to finish the permits needed for the work and to pay the $50 fee if necessary. Motion carried by two yes votes. There was some discussion about the turnback of SR 2022. The supervisors feel they should not take on another road when the township has enough trouble maintaining the roads it already has. A motion was made by Furney, second by Phelps to not accept the turnback of SR 2022 at this time. Motion carried by two yes votes. The supervisors approved an assessment permit for Richard Milazzo for a shed on Blanding Lake Road. They also reviewed information about paying off the infrastructure loan early. It is an interest-free loan so there wouldn’t be any savings, but it would help to get it off the books. The township will need to put in about $30,000 along with the balance in the infrastructure account to pay it off. This money could come from general township funds or the state fund. A motion was made by Furney, second by Phelps to do the legwork necessary to pay off the loan. Motion carried by two yes votes. A motion was made by Furney, second by Phelps to accept Resolution #3-16 for the new sewer construction account with Peoples Security Bank. Motion carried by two yes votes. A motion was made by Furney, second by Phelps to accept Resolution #4-16 for the PA Small Water & Sewer grant application through DCED. Motion carried by two yes votes. A letter was received from the Susquehanna County Commissioners to get input from the townships regarding the update of the county’s comprehensive plan and if ordinances and land use restrictions should be left at the local level or be made by the county. Jacob Rosen read a statement directed toward Supervisor Phelps and his handling of township business. This statement is on file in the township office. Joe Cowan made a complaint about not having dust control in the section of Tyler Lake Road currently in litigation. Brian Sanauskas was very upset with the condition of Cobb Road and the maintenance problems there have been over the years. Dale Ferger asked about the township solicitor and his role in the business of the township. An executive session was held before tonight’s meeting to discuss legal issues. A motion was made by Furney, second by Phelps to adjourn the meeting at 9:28 PM. The regular meeting of the Harford Township Supervisors was called to order in the township office by Chairman Doug Phelps at 7:00 PM. Supervisors Owens and Furney were present along with Secretary/Treasurer Carolyn Jennings, Roadmaster Jim Phelps, Township Solicitor Jamie Hailstone, and Peoples Bank Attorney Brian Koscelansky. Visitors present were Ted Brewster, Maureen Warren, Diane Smith, Dale Ferger, Adam Millard, Adam Briggs, and Dave Young. The minutes of June 21st were reviewed and accepted on a motion by Phelps, second by Furney. Motion carried by three yes votes. The bill list was approved as printed on a motion by Phelps, second by Furney. Motion carried by three yes votes. The treasurer’s report was filed for audit. Peoples Bank Attorney Brian Koscelansky explained the paperwork necessary to start the interim funding for the upgrade project. An ordinance was drawn up and advertised to meet all the requirements of the state’s debt act. The intent is to close in 30 days with a tax exempt interest rate of 2.5%. A motion was made by Furney, second by Phelps to accept Ordinance #52 as presented for a general obligation loan in the amount of $1,931,000. Motion carried by three yes votes. No bids were received from the ad placed last month for a price per gallon of oil to be sprayed on township roads. Vestal Asphalt had been contacted previously for a phone quote. The oil could be sprayed at night when there is less traffic and it would need to be cooler with low humidity. A motion was made by Phelps, second by Owens to allow Vestal Asphalt to spray a section of Stephens Road from SR 547 to Grinnell Road and to advertise for bids again for next month. Motion carried by three yes votes. A list of areas that need ditching has come up with a total of around 15,000 feet. This work can be done by a contractor with a min. 10 ton machine with a swivel and at least two triaxle trucks. A motion was made by Owens, second by Phelps to advertise for bids to be opened next month. Motion carried by three yes votes. A letter was approved and signed by the supervisors to ask for 50% of the White Road grant amount up front to get the work started. A betterment agreement was signed with Williams Field Services to provide 520 tons of 2A modified for using Sherwood Hill Road and Bartholomew Road for gas well activities. A section of Sherwood Hill Road was recently washed out by heavy rains. The ditches need to be cleaned out on both sides of the road and then rock lined with some larger rock. A motion was made by Phelps, second by Owens to get three phone quotes from contractors and then make a decision. Motion carried by three yes votes. There was a brief discussion about the turnback of SR 2022, but no further progress has been made. A quote was received from Chemung Supply for guiderails on Upper Podunk Road. There are three sections of work for a total of $5,743.20. A motion was made by Owens, second by Phelps to accept this quote and have the work done. Motion carried by three yes votes. Roadmaster Jim Phelps brought up some areas that are a high priority for fill to be put in to keep the water off the road and be able drain down the edges. The township already has some fill that can be used and the rest can be obtained at a reasonable cost. Measurements will be compiled to put the areas together as a project and go out for bids on this work. Only one response was received to the employment ad placed last month. The supervisors agreed to place another ad in the Shopping Guide this time. The supervisors approved an assessment permit for Rebecca Mordent for a small deck on Tannery St. They also reviewed a subdivision for Julie Lepre on Orphan School Road and had no objections. An invitation was received to the annual county convention for township officials. It will be held October 20, 2016 at the Montrose Bible Conference. A motion was made by Furney, second by Owens to place an ad in the convention book for $40. Motion carried by three yes votes. A letter was received from Ted Brewster complimenting the township on the many improvements made to the roads in the past few years. Dale Ferger gave details about the number of Harford Township residents who attended the town meeting about the proposed incinerator. Diane Smith asked how soon the work could be scheduled to spray the oil on Stephens Road. Maureen Warren asked for information about the Harford Post Office. Adam Millard presented information on True View Security Solutions and some of the products they offer. An executive session will be held after tonight’s meeting to discuss the legal situation at Tyler Lake. A motion was made by Phelps, second by Furney to adjourn the meeting at 8:05 PM. The regular meeting of the Harford Township Supervisors was called to order in the township office by Chairman Doug Phelps at 7:00 PM. Supervisors Owens and Furney were present along with Secretary/Treasurer Carolyn Jennings. Visitors present were Ted Brewster, Maureen Warren, Dorothy Hagenbuch, Jim Phelps, Nick Estabrook, Martin Barhite, Diane Smith, Jake Rosen, Dale Ferger, Alan Ribbe, and Joanne Smith. The minutes of May 17th were reviewed and accepted on a motion by Phelps, second by Owens. Motion carried by three yes votes. The minutes of May 24th were reviewed and accepted on a motion by Phelps, second by Owens. Motion carried by three yes votes. The bill list was approved as printed on a motion by Phelps, second by Owens. Motion carried by three yes votes. The treasurer’s report was filed for audit. The contract with the Conservation District for the Dirt & Gravel Roads grant for White Road was signed. Three bids were received for this project: Ken Rauch Excavating - $79,439, Barhite Excavating - $119,100, and Estabrook Excavating - $126,800. After some discussion and checking to make sure the DSA material was certified, a motion was made by Owens, second by Phelps to award the bid to Ken Rauch Excavating as the lowest bidder. Motion carried by two yes votes; Supervisor Furney abstained as she has property on this road. Two bids were received for DSA trucking and placement: Barhite Excavating - $7.58/ton and Stafursky Paving - $9.80/ton. This will be used for approximately 3800 tons of DSA on sections of four different roads. A motion was made by Furney, second by Phelps to accept the low bid from Barhite Excavating. Motion carried by three yes votes. The supervisors have discussed plans for ditching, but are still trying to decide which roads and how much footage to do at what cost. They will continue to work on a plan and may have bid specifications prepared by next month. There was some discussion about dust control alternatives. The lower end of Stephens Road is a trouble spot because anything that is sprayed there dries out too quickly and that road has a lot of traffic. A motion was made by Owens, second by Phelps to advertise for bids on a price per gallon for oil to be sprayed on sections of township roads. Motion carried by three yes votes. Roadmaster Jim Phelps brought up two areas that are a high priority for ditchwork to be done. One is a 400 ft. section on North Harmony Road and the other is a 50 ft. section on Three Lakes Road. A contractor can clean and rock line those areas using material the township has. Three contractors were asked for prices, two declined and Barhite Excavating quoted a price of $3000. A motion was made by Phelps, second by Furney to accept the price from Barhite and have this work done. Motion carried by three yes votes. There is a need for more help for the road crew. With only two full-time employees and some part-time help on and off, the summer roadwork is starting to fall behind schedule. The supervisors agreed to place an ad looking for a full-time operator/laborer with a CDL required and equipment experience preferred. JHA Companies, the township’s code enforcement agency, had revised their fee schedule at the beginning of this year. Some charges remained the same and other ones increased slightly. A motion was made by Phelps, second by Furney to adopt the 2016 JHA Companies fee schedule. Motion carried by three yes votes. Word was received that the interim loan with Peoples has been approved. The paperwork has been started, but is not yet ready to be signed. A motion was made by Furney, second by Phelps to be able to complete the paperwork with the attorney’s approval. Motion carried by three yes votes. Dale Ferger spoke about the hazardous waste incinerator proposed off the Gibson exit. A meeting was held recently in New Milford to get information out to the public. Air quality is a major concern with the emissions and particles being released. Another problem would be transporting the hazardous waste to the site and large quantities being stored there. Contact was made with a lawyer experienced in this type of issue, but there would be costs involved. An effort is being made to get people and townships to work together on this issue. The supervisors agreed to try to hold a town meeting at the Harford Fire Company hall on Wednesday, June 29 at 6:00 PM. A motion was made by Phelps, second by Owens to adjourn the meeting at 8:54 PM. The special meeting of the Harford Township Supervisors was called to order in the township office by Chairman Doug Phelps at 7:00 PM. Supervisors Owens and Furney were present along with Secretary/Treasurer Carolyn Jennings and Attorney Jamie Hailstone. Visitors present were Ted Brewster, Gerry Yushinsky, Terry VanGorden, Bruce and Marion Seamans, Jim Phelps, Nick Estabrook, Peg Smith, Dale Ferger, and George Weideman. There was further discussion about the DSA placement quotes from last week. A suggestion was made to put all the jobs together as a group and then go out for sealed bids. DSA will be placed on sections of Orphan School Road, Tingley Street, Wolf Lake Road, and Stephens Road. The township will supply the material at the FOB bid price that was previously accepted. The contractor will do the trucking and the placement. A motion was made by Phelps, second by Furney to put these locations out for bid. Motion carried by three yes votes. The supervisors and roadmaster plan to get together and make a list of areas where ditching needs to be done. Then they will have a better idea of how much cost is involved. A motion was made by Owens, second by Phelps to award the project to Frank Payne Excavating at a price of $12,200. Motion carried by three yes votes. The turnback of SR 2022 was discussed again. Ed Sumski from PennDOT was out and traveled the road to further review the improvements that need to be made before the township would take it on. This process may take a while to prepare the final paperwork and bid specifications. A contract was signed for the guard rail installation that was approved last week. The township cleanup will be starting June 6th. A motion was made by Furney, second by Owens to approve Amie Yasnovich to help with the cleanup again this year. Motion carried by three yes votes. There were some questions from the visitors about the roadwork plan that was discussed last week and how the order is decided. The plan is to rotate the sections each year so that the same roads are not always first or last. They also asked about spending money on the less traveled roads that are in pretty rough shape. Liquid fuels money is received for those roads and must meet a minimum criteria to not have that money taken away. Attorney Jamie Hailstone gave an explanation of the bidding process and how bids are awarded to the lowest, responsible bidder. He also recommended that it would be safer to group jobs together and get sealed bids even on projects that fall under the bidding thresholds. A resolution can be passed by the supervisors to define the township’s bidding policy. Attorney Jamie Hailstone gave an update on the interim financing for the upgrade project. Peoples Bank should be approving it later this week and may be ready to close by the middle of June. He is also working on opinion letters and other paperwork for USDA. Jim Phelps mentioned a problem with the brakes on the roller as it stalled out and took off earlier today. This is something that needs to be taken care of to be able to continue to use it for the summer road work. A motion was made by Owens, second by Phelps that due to safety concerns to have the roller transported by Estabrook Excavating when it has to be moved from a dirt road to a paved road. Motion carried by three yes votes. Supervisor Phelps announced an executive session will be held with Attorney Jamie Hailstone after the meeting for the purpose of discussing legal issues. A motion was made by Phelps, second by Furney to adjourn the meeting at 8:08 PM. The regular meeting of the Harford Township Supervisors was called to order in the township office by Chairman Doug Phelps at 7:00 PM. Supervisors Owens and Furney were present along with Secretary/Treasurer Carolyn Jennings. Visitors present were Ted Brewster, Maureen Warren, Adam Briggs, Bruce and Marion Seamans, Josephine Gear, Jake Rosen, Gary Cameron, Chris Latwinski, and Rocky and Nick Estabrook. The minutes of April 19th were reviewed and accepted on a motion by Phelps, second by Furney. Motion carried by three yes votes. The bill list was approved as printed on a motion by Furney, second by Phelps. Motion carried by three yes votes. The treasurer’s report was filed for audit. The DSA material bid from New Enterprise Stone & Lime Co. was reconsidered with a FOB price of $9.80/ton. A motion was made by Owens, second by Phelps to accept this bid. Motion carried by three yes votes. Vestal Asphalt - $3500 per day + $500 mobilization. Estabrook Excavating plans to work with a paver from Suit-Kote and wants to do this to finish the Oliver Road grant work, as soon as Suit-Kote is available. There was some discussion about the quality of work and other factors that needed more time to review. A motion was made by Phelps, second by Furney to hold a special meeting on May 24th at 7:00 PM for general purposes and for Estabrook Excavating to proceed with the DSA placement on Oliver Road if Suit-Kote is available in the meantime. Motion carried by three yes votes. A proposal for Houlihan Road was prepared by Supervisor Owens, which breaks the road into two sections. One section is general maintenance that can be done by the township road crew and the other section will need a pipe replaced, the bank cut back, and fill put in that can be done by a contractor. Some quotes have been submitted to see if the cost is high enough to have to advertise for bids. There was some confusion as to how much of the road was to be included in the cost estimates. The contractors can redo their quotes, which will be considered at the special meeting next week. The Dirt & Gravel Roads grant for White Road is still pending approval. To keep things moving along, the bid advertisement can be placed with the stipulation of grant approval, and be ready to open next month. The bid specifications have already been prepared by Ed Sumski of PennDOT. A motion was made by Owens, second by Furney to advertise for bids for White Road, with the work to be done pending grant approval. Motion carried by three yes votes. The turnback of SR 2022 was discussed. A meeting will be set up with Ed Sumski to review the road more carefully before a decision is made. Two quotes were received for ditching on roads throughout the township, with high priority areas being on North Harmony and Beaver Meadow Roads. Estabrook submitted a quote of $100/hr. and Barhite submitted a quote of $105/hr. There was a heated discussion about the order in which the roads should be worked, according to the plan or addressing the complaints about the worst areas. Ditching quotes will be tabled until next week’s meeting. A price of $5,074.08 was given by Chemung Supply to replace the guard rails on the Lower Podunk Road bridge. This has been an issue in previous inspections. A motion was made by Owens, second by Phelps to accept this price and have the guard rails installed. Motion carried by three yes votes. Supervisor Owens has obtained prices for the concrete needed for the containment wall and wash pad. The cost for the wall would be $300 plus a yard and a half to two yards of concrete. The cost for the wash pad and floor drain would be $1,040.25 plus nine and a half yards of concrete. Supervisor Phelps suggested waiting until late in the summer/early fall as things are quite busy now and to have a chance to see how well the salt brine works for dust control. Rick Moser has agreed to do lawn mowing at the township building and the sewer plant for $90 each time, the same price as last year. A motion was made by Owens, second by Phelps to approve this. Motion carried by three yes votes. Assessment permits were approved for Goldsmith – barn on Upper Podunk Road and Cameron – pole barn on Tingley Lake Road. Dave Klepadlo, the township’s sewer engineer, has requested two new E-1 pumps complete with basins. A motion was made by Furney, second by Owens to approve this purchase. Motion carried by three yes votes. Bruce Seamans mentioned a problem with the guard rails on Plank Road not working as well since the road surface has been raised. Supervisor Phelps announced an executive session will be held after the meeting for the purpose of discussing the ongoing legal issues at Tyler Lake. A pre-trial meeting was held today and a trial date has been set for September 29-30, 2016. A motion was made by Phelps, second by Furney to adjourn the meeting at 8:26 PM. The regular meeting of the Harford Township Supervisors was called to order in the township office by Vice-Chairman Conrad Owens at 7:00 PM. Supervisor Furney was present along with Secretary/Treasurer Carolyn Jennings. Supervisor Phelps was absent due to illness. Visitors present were Ted Brewster, Maureen Warren, Bob DeLuca, Connie Breese, Adam Briggs, and Jim Phelps. The minutes of March 15th were reviewed and accepted on a motion by Furney, second by Owens. Motion carried by two yes votes. The minutes of March 28th were reviewed and accepted on a motion by Furney, second by Owens. Motion carried by two yes votes. The bill list was approved as printed on a motion by Furney, second by Owens. Motion carried by two yes votes. The treasurer’s report was filed for audit. Bob DeLuca and Connie Breese presented the Audit Report for 2015. The tax records and township records were both in order. No specific recommendations were made on any issues. The 2016 Roadwork season has begun with work starting on Burns Road and then moving on through the priority list. The project for the Jeffers Rd./SR 106 intersection has been completed. Two quotes were received for the placement of DSA. Barhite Excavating submitted a quote of $3.75 per ton and Estabrook Excavating submitted a quote of $3.30 per ton. There were some questions about who would be trucking the material for each project and what the total costs would be. They decided to table making a decision. Bids were opened for the products requested last month. Liquid Calcium: Vestal Asphalt – $0.967 per gallon Suit-Kote Corp – $1.00 per gallon. A motion was made by Furney, second by Owens to accept the bids from both Vestal Asphalt and Suit-Kote Corp. Motion carried by two yes votes. DSA: New Enterprise Stone – $13.60 job site, $14.60 as directed. This bid was tabled to obtain a FOB price. A motion was made by Owens, second by Furney to award the bid to Ace Robbins. Motion carried by two yes votes. A motion was made by Owens, second by Furney to award the bid to Kiefer Trucking. Motion carried by two yes votes. A complaint was received about the condition of Houlihan Road. After checking out the problem, the road is in horrible shape and would need fill put in to raise the road and allow water to go into the ditches. They decided to work on a plan and come up with some cost estimates. An application will be submitted for a Dirt & Gravel Roads grant on White Road. The project should be approved because it meets all the criteria of the program. Lenox Township still has not paid their share of the workers comp policy for the Fire Company from last year. A cost breakdown was prepared by DGK Insurance and submitted with the bill. The secretary will check and see if the insurance company can help us any further. A motion was made by Furney, second by Owens to appoint Carolyn Jennings as the Harford Township representative to the Susquehanna County tax collection committee. Motion carried by two yes votes. Assessment permits were approved for Nelson – garage on Wescott Road and Koes – wood shed on Tingley St. The supervisors agreed to hold the township cleanup starting on June 6th at the same price as last year. Electronics cannot be accepted. A motion was made by Furney, second by Owens to allow the Fire Police to assist with the Nicholson Wine Festival on May 14th. Motion carried by two yes votes. A retaining wall needs to be put in place for the salt brine storage tank. A DEP representative will be coming to look over the setup and make sure the proper paperwork is in place before the permit is issued to be able to spray. Concrete will also be needed for a washpad out back and to redo some of the shop floor. A plan will be worked on to come up with more definite costs. Carolyn Jennings gave a report on what she learned from the PSATS Convention in Hershey. There were several speakers on statewide issues and workshops on accounting, payroll, management, and natural gas infrastructure. Maureen Warren asked about the possible turnback of SR 2022 and mentioned a dip that needs to be filled in where a sluice pipe was replaced on Lower Podunk Road. A motion was made by Owens, second by Furney to adjourn the meeting at 8:04 PM. The special meeting of the Harford Township Supervisors was called to order in the township office by Chairman Doug Phelps at 7:00 PM. Supervisors Owens and Furney were present along with Secretary/Treasurer Carolyn Jennings. Visitors present were Ted Brewster and Jim Phelps. Bids were opened for road materials and tri-axle trucking. A motion was made by Owens, second by Phelps to accept both bids for stone materials to be used as needed. Motion carried by three yes votes. A motion was made by Phelps, second by Owens to accept the bids from Barhite Excavating, Diaz Companies, Young Transporting, Ronald B. Kiefer, Gary S. Blewett, and Stoney Mountain Tractor Parts, with Barhite called first and the rest at the Roadmaster’s discretion. Motion carried by three yes votes. New quotes were received on getting a full truckload of pipe. Chemung Supply gave a price of $10,547.20 and Marie Turner gave a price of $11,449.10 for the sizes and amounts needed. There was some discussion about pipes from different vendors not fitting together and also being able to get the supplies locally. A motion was made by Owens, second by Furney to accept the quote from Chemung Supply for a full truckload plus some extra collars to have on hand if needed. Motion carried by three yes votes. The supervisors had more discussion about Frank Payne’s quote in the amount of $8500 for work to widen Wescott Road, with the township providing two triaxle trucks to haul fill. A motion was made by Owens, second by Phelps to accept this quote to have the work done. Motion carried by three yes votes. A letter was received from the Susquehanna County Conservation District that a Dirt & Gravel Roads grant was awarded for Bartholomew Road in the amount of $12,200 to be used as an educational project on installing a French mattress. A motion was made by Phelps, second by Owens to accept this grant and sign the contract. Motion carried by three yes votes. An employment application was received from Todd Decker, who has a CDL and can operate heavy equipment. A motion was made by Owens, second by Phelps to approve adding him to the list of part-time employees to work as needed. Motion carried by three yes votes. An estimate was received from All-American Rooter for one full day of work to flush out pipes in the township for $1200. A motion was made by Owens, second by Phelps to try this out for one day and see how it works. Motion carried by three yes votes. Williams Field Services will need to close a section of Old Route 11 for three to four months to dig a new pipeline. A Betterment Agreement has been proposed to allow this in exchange for $12,000 of 2A stone at the end of the project. A motion was made by Owens, second by Phelps to accept the agreement. Motion carried by three yes votes. It is necessary to adopt a Loan Resolution to obtain the funding through USDA. The loan total has been calculated at $1,931,900 at a fixed interest rate of 2.5% for a term of thirty-nine years. Monthly loan payments are estimated at $6,432 and monthly user fees should be around $50. A motion was made by Phelps, second by Furney to adopt this Loan Resolution #2-16. Motion carried by three yes votes. There was some discussion about the possibility of the township taking SR 2022 as a turnback road from the state. A motion was made by Phelps, second by Owens to adjourn the meeting at 8:13 PM. The regular meeting of the Harford Township Supervisors was called to order in the township office by Vice-Chairman Conrad Owens at 7:02 PM. Supervisor Furney was present along with Secretary/Treasurer Carolyn Jennings. Supervisor Phelps was absent due to illness. Visitors present were Ted Brewster, Maureen Warren, Dottie Hagenbuch, and Jim Phelps. The minutes of February 22nd were reviewed and accepted on a motion by Furney, second by Owens. Motion carried by two yes votes. The bill list was approved as printed on a motion by Owens, second by Furney. Motion carried by two yes votes. The treasurer’s report was filed for audit. Two fire company representatives, Pete Mecca from Hop Bottom and Chad Batzel from Harford, came to present a plan for putting a dry hydrant back in Kingsley. Water would be pumped out of Martins Creek from the Harford Township side. Permits will be needed from the Conservation District to be able to do construction in the creek. They asked if the township could apply for these permits so the fire company would not have to pay the fees. The supervisors agreed to get the paperwork completed as soon as possible. Barhite Excavating sent an estimate for DSA on Orphan School Road. There were some questions as to whether the material was included in the price or just the cost of putting it down. They decided to wait for new figures and then see if actual bids would be necessary. Pennay Hill and Payne Roads have been badly washed out and are in need of serious repairs. Frank Payne submitted a quote of $5000 to do what needs to be done, with the township supplying some pipes. A motion was made by Owens, second by Furney to accept the quote from Frank Payne. Motion carried by two yes votes. He had also given another quote in the amount of $8500 for work to widen Wescott Road, with the township providing two triaxle trucks. The supervisors decided to wait before making a decision on that project. Prices have been received from three different vendors on various sizes of pipes. There was some discussion about whether to purchase a whole truckload or just what is needed for this year. The cost effectiveness of both options will be compared further to make the best choice. A motion was made by Furney, second by Owens to request bids for the following items: 1400 yards of black cinders, 41,000 gallons of liquid calcium, 9000 gallons of diesel fuel, 2500 gallons of gasoline, and 3800 tons of DSA, to be opened at the regular meeting on Tuesday, April 19, 2016. Motion carried by two yes votes. Conrad Owens explained an idea he is working on to develop a nozzle that can be used with a pressure washer to be able to clean out pipes that are plugged. This would help the township save money over having to hire someone to come in with their equipment. The application for funding through USDA requires having legal service agreements for the solicitor and bond counsel. A motion was made by Furney, second by Owens to accept the agreement with solicitor James Hailstone in the amount of $25,000. Motion carried by two yes votes. A motion was made by Furney, second by Owens to accept the agreement with bond counsel Andrew Hailstone in the amount of $20,000. Motion carried by two yes votes. Ted Brewster asked about the township receiving impact fee money this year. It should come this summer, but it may be less than previous years. A motion was made by Owens, second by Furney to adjourn the meeting at 7:58 PM. The rescheduled regular meeting of the Harford Township Supervisors was called to order in the township office by Chairman Doug Phelps at 7:02 PM. Supervisors Owens and Furney were present along with Secretary/Treasurer Carolyn Jennings. Visitors present were Ted Brewster, Maureen Warren, Dottie Hagenbuch, Robert Supancik, Craig and Tanner Stout. The minutes of January 4th Reorganization and Regular meetings were reviewed and accepted on a motion by Phelps, second by Owens. Motion carried by three yes votes. The bill list for February 16th was approved as printed on a motion by Furney, second by Phelps. Motion carried by three yes votes. The treasurer’s reports for December 31, 2015 and Jan./Feb. 2016 were filed for audit. There was a question and some discussion regarding the agreement with the PA Fish & Boat Commission concerning the beaver dam disturbance at the site of the Nine Partners Monument. Dave Klepadlo, the township’s sewer engineer, was present to explain the revisions and supplement to the engineering agreement for the USDA application. These revisions were necessary to include the proper language required by the government and the agreement had to be re-signed. A motion was made by Furney, second by Owens to approve the revised engineering agreement with USDA. Motion carried by three yes votes. A new tank complete with pump needs to be purchased to have on hand as a spare because the other ones were used. A motion was made by Furney, second by Owens to purchase a spare tank complete with pump. Motion carried by three yes votes. Conrad Owens reported they have been cutting brush, replacing road signs, fixing Wilkins Road, and coming up with the roadwork plan for 2016. He also requested an additional $9000 to be added to the budget amount for tree trimming. A letter was received from the Conservation District that a Dirt & Gravel Roads grant was awarded for Oliver Road in the amount of $51,100 in order to raise the surface and add DSA to the top. The township in-kind cost for the project will be around $5000. A motion was made by Owens, second by Phelps to accept and sign the contract with the Conservation District for Oliver Road. Motion carried by three yes votes. A plan is being worked on to add DSA to a section of Orphan School Road. More information is needed on the cost so it will be tabled until next month for the supervisors to make a decision. The possibility of applying salt brine to the roads is being explored as an option for dust control this year. The cost per gallon is substantially cheaper than liquid calcium, but it can only be applied in certain areas that are away from any waterways. An application is being filled out to get a permit from DEP and a letter of intent needs to be submitted as part of that paperwork. A motion was made by Owens, second by Phelps to approve the letter and continue the process. Motion carried by three yes votes. A sight distance project has been developed with the help of LTAP engineers to improve the intersection of Jeffers Road and SR 106. The slope of the bank will be changed so that cars pulling out can see far enough down the road to do it safely. An estimate of $3470 was prepared by Barhite Excavating to cut back the bank. Paperwork is being filled out to get approval from PennDOT and a letter will be sent to the property owner involved. A motion was made by Phelps, second by Owens to accept the estimate from Barhite to do the work at the intersection of Jeffers Road and SR 106. Motion carried by three yes votes. Amounts will be more or less and will need prices for delivery to our yard, a job site, and FOB. Bids will also be requested for tri-axle trucking in two categories: general hauling/ditching and tailgating road materials. Because of the meeting being rescheduled to a later day, to have enough time to be properly advertised, these bids will be opened at a special meeting to be held Monday, March 28, 2016. Bids for fuel, cinders, calcium, and other items will be tabled until the proper amounts are determined. A motion was made by Phelps, second by Furney to appoint Carolyn Jennings as the township’s Right-to-Know Officer. Motion carried by three yes votes. The supervisors reviewed the application for the Rhodes subdivision on Orphan School Road. They had no objections and stated the existing driveway on the property is satisfactory. A letter was received from Timothy Button, the township’s former tax collector. He would like to close out his tax bank account and be reimbursed for the personal funds that remain. A check for the balance in the account was made out to the township. A motion was made by Owens, second by Phelps to reimburse Timothy Button in the amount of $4753.62 to close out his tax collector bank account. Motion carried by two yes votes, with Furney abstaining. Rob Supancik gave information about getting ready for the upcoming baseball season. They have received a grant from the pipeline to put in a new outfield fence. Further drainage work needs to be done and a proposal from Rocky Estabrook was received in the amount of $2600 to do the work with the township supplying some materials. A motion was made by Owens, second by Furney to accept this proposal to have the work done. Motion carried by three yes votes. Mr. Supancik also asked about putting up a sign to direct people to get to the ballfield. The township has no sign ordinance, but the supervisors requested that he check with the property owners for permission and make the sign temporary so that it can be taken down after the season is over. Craig Stout asked about the possibility of the township looking to take over the mansion in town for a meeting space or community center. The initial price being high and the extra costs of renovating would make it unlikely for the township to pursue. A motion was made by Phelps, second by Owens to adjourn the meeting at 8:33 PM. The regular meeting of the Harford Township Supervisors was called to order in the township office by Chairman Doug Phelps at 7:22 PM. Supervisors Owens and Furney were present along with Secretary/Treasurer Carolyn Jennings. Visitors present were Jim Phelps, Ted Brewster, Maureen Warren, and Dottie Hagenbuch. Dave Klepadlo, the township’s sewer engineer, was present to explain the engineering agreement for the USDA application. The total engineering fees for the project are estimated at $150,000 with the design phase being $72,000. The user fees are currently projected at $159/EDU per quarter, but that could change as the actual construction bids are received. The plan is to design in 2016 and to construct in 2017. A motion was made by Furney, second by Owens to accept the engineering agreement. Motion carried by three yes votes. The minutes of December 8th were reviewed and accepted on a motion by Phelps, second by Furney. Motion carried by three yes votes. The bill list for December 31st was approved as printed on a motion by Owens, second by Phelps. Motion carried by three yes votes. The bill list for January 4th was approved as printed on a motion by Owens, second by Phelps. Motion carried by three yes votes. The treasurer’s report will be available at the next meeting. Jim Phelps reported that they have been mowing, brush cutting, and working on upgrades for the stop signs and road name signs. The supervisors approved Resolution #1-16 for new signature cards for the township accounts at Peoples Security Bank. They also approved a driveway permit for Williams Field Services on Bartholomew Road. A motion was made by Furney, second by Owens to accept the 2016 service agreement with JHA Companies. Motion carried by three yes votes. Supervisor Owens mentioned he would like to look at installing a concrete wash pad by the back garage door. Supervisor Phelps announced there will be a 6 month extension for the timeline on getting postal service back in Harford. The Annual Reorganization Meeting of the Harford Township Supervisors began at 7:02 PM in the township office. A motion to appoint Conrad Owens as Temporary Chairman was made by Furney, second by Phelps. Motion carried by three yes votes. A motion to appoint Carolyn Jennings as Temporary Secretary was made by Furney, second by Owens. Motion carried by three yes votes. A motion to nominate Doug Phelps as 2016 Chairman of the Board was made by Furney, second by Owens. Motion carried by three yes votes. A motion to nominate Conrad Owens as 2016 Vice-Chairman was made by Furney, second by Phelps. Motion carried by two yes votes, with Owens abstaining. A motion to appoint Carolyn Jennings as Secretary/Treasurer was made by Furney, second by Owens. Motion carried by three yes votes. Compensation will be set at an Executive Session. A motion to appoint Sue Furney as Assistant Secretary was made by Owens, second by Phelps. Motion carried by two yes votes, with Furney abstaining. Compensation will be set by the township auditors. A motion to appoint Jim Phelps as Roadmaster was made by Owens, second by Phelps. Motion carried by two yes votes, with Phelps abstaining. Compensation will be set at an Executive Session. A motion to appoint Conrad Owens as Assistant Roadmaster was made by Phelps, second by Furney. Motion carried by two yes votes, with Owens abstaining. Compensation will be set by the township auditors. The supervisors recognized Harry Buchanan, Carl Colwell, and Jim Phelps as full-time employees and Hol Adams, Andy Brigham, Wayne Frederici, Conrad Owens, Trevor Payne, and Jerry Yushinsky as part-time employees. Compensation will be set at an Executive Session. The Treasurer’s Bond for 2016 was set at $1,500,000. A motion to reappoint the firm of Kreder Brooks Hailstone as the township’s legal counsel with Jamie Hailstone as the primary and Drew Hailstone as secondary was made by Furney, second by Phelps. Motion carried by three yes votes. A motion to appoint Dorothy Hagenbuch to serve as Chairman of the Vacancy Board was made by Owens, second by Furney. Motion carried by three yes votes. A motion to appoint Peoples Security Bank & Trust as the depository for township funds was made by Furney, second by Owens. Motion carried by two yes votes, with Phelps abstaining. The supervisors will hold regular meetings at the township building at 7:00 PM on the third Tuesday of each month. A motion to certify Carolyn Jennings as the voting delegate to the State Convention was made by Furney, second by Owens. Motion carried by three yes votes. The supervisors established the paid holidays for the employees as May 30th - Memorial Day, July 4th, September 5th - Labor Day, November 24th and 25th - Thanksgiving Day and the day after, December 26th - Christmas, and January 2, 2017 - New Years Day. The supervisors appointed Steve Smith as the township’s Emergency Management Coordinator and Doug Phelps as deputy. There was no old business or public comments. A motion was made by Phelps, second by Furney to adjourn the reorganization meeting at 7:21 PM.